SBBI Superior Battery Back-Up Products - Venture Mfg. Co. The Superior Battery back-up (SBBI) is the ultimate solution for intermittent power loss. Venture Mfg. Co., the authorized distributor of Byan Systems Inc., provides these units to customers who require battery power solutions for gating systems. The SBBI battery back-up is capable of powering the batteries of single as well as double gate systems. They can support single gates with 1-2 gate operators, as well as double gate systems with 2-4 operators. The SBBI battery back-up comprises a variety of unique features. The following components have been carefully integrated into the SBBI battery back-up to increase its efficiency and reliability. Trip-Lite Inverter: As a brand, Trip-Lite is renowned for its inverter products. The addition of the inverter in the battery design enhances the SBBI’s reliability. The inverter is provided with a conservative design and rating. It also consists of battery and load indicators. Transformer Output Inverter: This inverter type allows for better waveforms, and reduces heating of the motor. The addition of the inverter means that the battery back-up can be grounded in accordance to NEC regulations. Voltage and Frequency Inverter: This is designed to support the back-up’s motor operation. The inverter also allows for a wider voltage range in terms of performance. Commercial Safety Components: We only utilize parts that are listed in or recognized by UL/CSA. Utilizing UL/CSA listed parts ensures reliable operation and provides assurance that a huge supply of spare parts will be available. Locally Procured Battery: Sourcing batteries locally reduces the overall price and manufacturing costs. The batteries are chosen by size to suit application requirements. 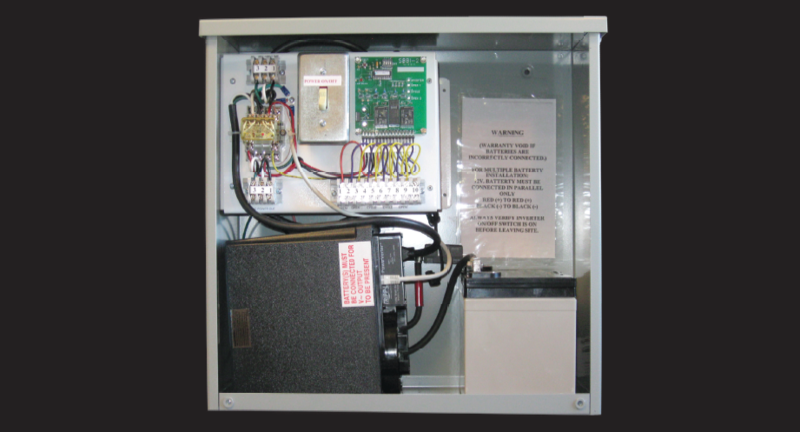 Inverter Control Board Sequence Indicators: These allow operators to effectively monitor the power-up operations. • Grid Power Switches: The switches allow for quick disconnection of power so maintenance teams can perform safety and other testing procedures. Test Buttons on Control Boards: Test buttons allow operators to perform complete load and operation tests. They also help in checking the power quality and battery back-up performance. Battery Charger/Maintainer: The charger allows the back-up to keep the battery full charged, and also prevents it from over charging.